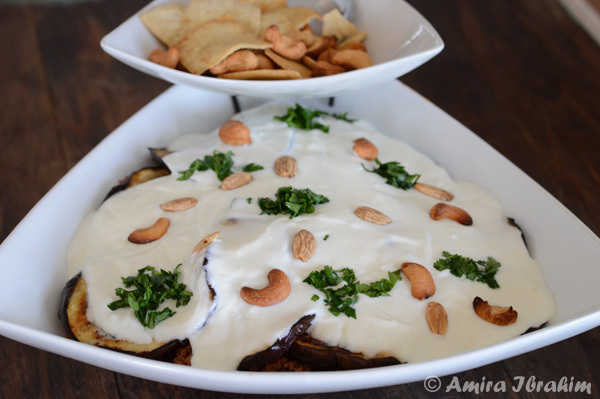 In this eggplant casserole fatet makdous, you will find crispy roasted flat bread pieces topped with layers of eggplant and saucy minced meat with a final yogurt, garlic sauce. 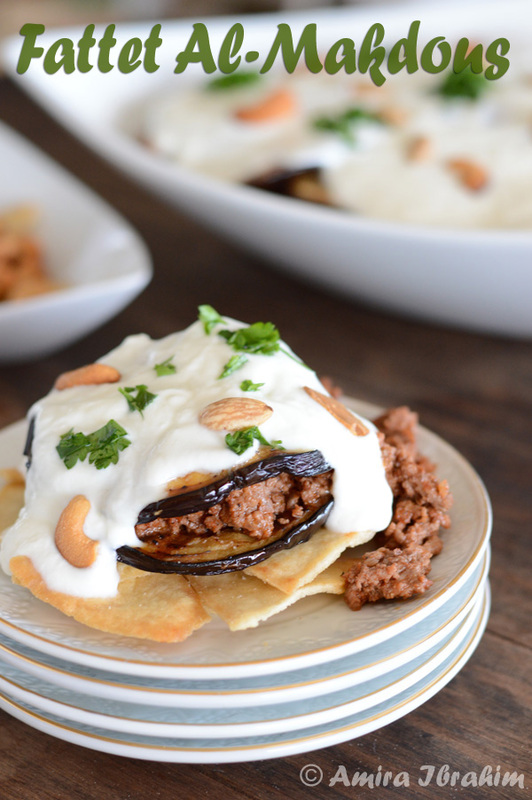 A Syrian recipe that will take the eggplants from average to amazing. 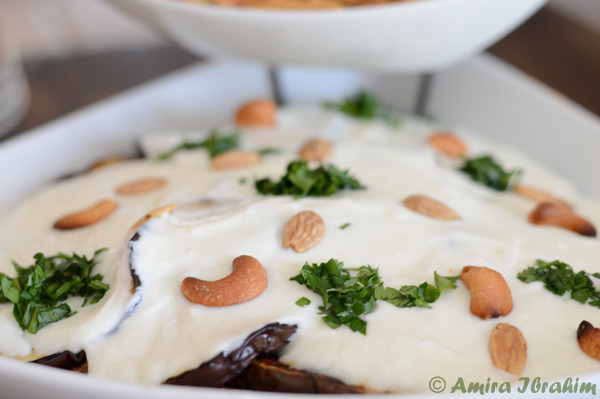 If there ever was an eggplant dish that could tease me into submission, this would be it. 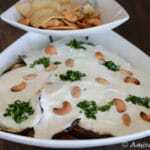 Fatet batinjan ,or eggplant fatteh, is supposed to be made with Italian eggplant, you know the kind that is small and short. These eggplants are supposed to be deep fried then stuffed with prepared minced meat. 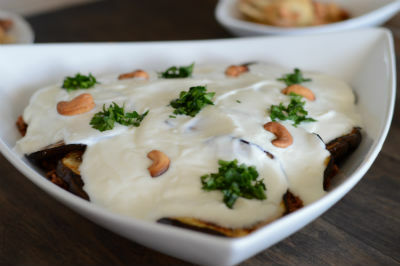 Fattah is then prepared by layering pieces of crunchy golden flat bread topped with tomato sauce then comes the little stuffed cute eggplants, covered with a luscious yogurt sauce… really so tasty. 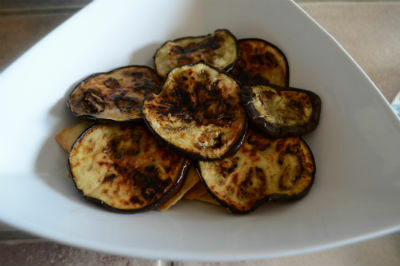 It is hard to find the Italian eggplants, or at least near me, so I’ve made some modifications under the supervision of a dear Lebanese friend, just to make sure it is still acceptable and can still carry the same name as the original recipe and I hope my dear Levant readers will not mind. First, as I’ve done in the last time, fattoush recipe, I’ve used store bought baked pita chips. But I repeat that making your own is much tastier especially if fried and not baked, but for my own convenience, as the soccer season is driving me crazy, I leaned towards the easy option … store bought. For the eggplants, I’ve used the ordinary eggplants, the one that you can find anywhere, pan seared them in a little oil as I usually do. 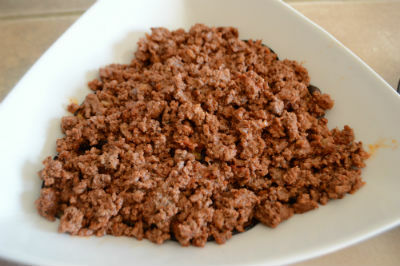 Then stacked them with the minced meat in between. I also did not drizzle the chips with the tomato sauce as I do not like the bread to be soggy, I like it super crunchy to the last bite. So I’ve prepared the minced meat and added the tomato paste to the meat while cooking it, Turned out great and not too watery. 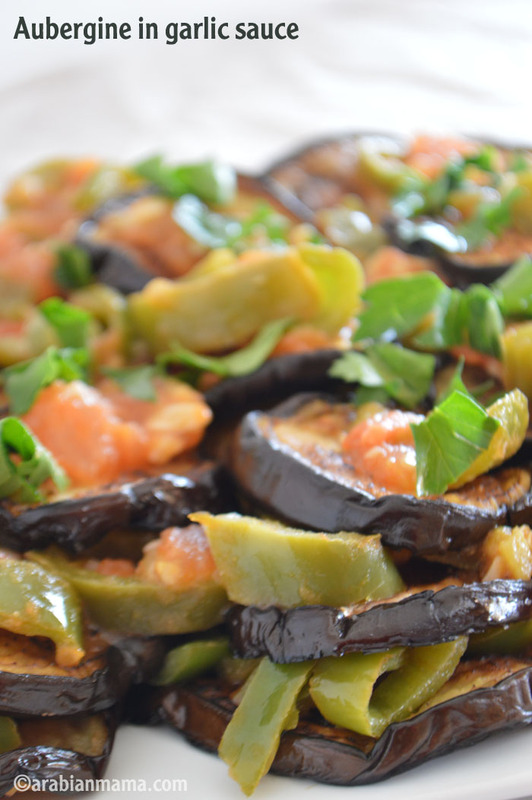 We ended up a happy family with this recipe, and by family I mean me, my husband and my mother in law who I was so surprised to find that she shares my late dad’s passion about eggplants :). Do not ask me about my kids, they did not even touch it, they do not touch a plate of hummus, it is a total disgrace to admit that my kids – who are a Middle Eastern descendants – do not eat hummus!! imagine how sad I am. But I guess this will change when they grow up, I do believe so. For my Father in law he does not eat eggplants at all… another sad fact that I discovered after 17 years of being in this family . 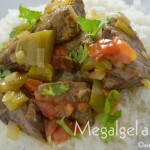 So moral of the story, if you are a fan, then by all means go ahead and try this recipe you’ll like it for sure. 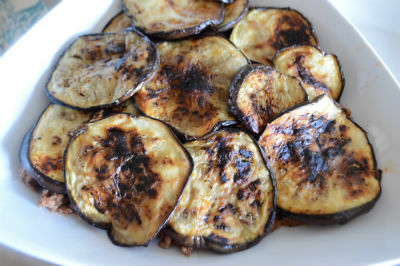 If you do not hate eggplants but not crazy about them, I highly recommend this dish, it is very flavorful. But if you absolutely hate everything and anything eggplants, then…. wait for my next post, I promise it will not have eggplants in it. 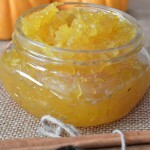 I hope you’ll like making this recipe and until next time …. Have a wonderful OCTOBER. 3 medium eggplants cut into rings. 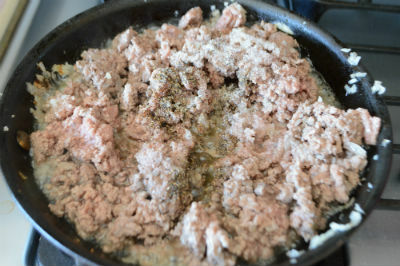 1/4 cup oil + 2 Tablespoons for browning the meat. 5 medium pita breads cut into squares. Oil for frying or for toasting in the oven. Heat a nonstick pan on medium. 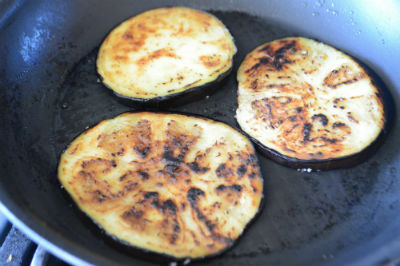 add the eggplant pieces, brushing with olive oil on both sides, until nicely browned. Takes about 2 minutes per side. 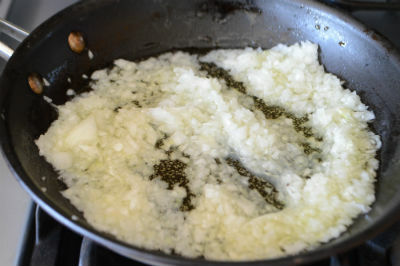 While the eggplants are cooking start preparing the meat, in another skillet over medium heat add 2 Tablespoon oil , then saute onion for 2 minutes or until fragrant. 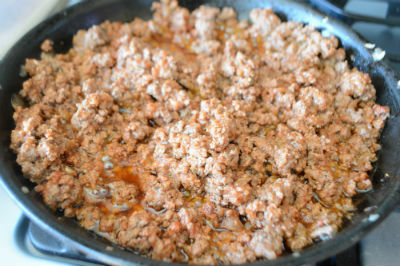 Add the meat and spices, stirring well until the meat is almost completely browned. Add the tomato paste and stir well to combine, let it cook for another 5 minutes then remove from heat. Prepare the pita chips by deep frying( tastiest option), or toasting in the oven until golden brown(healthiest option) or buy a bag of pita chips(easiest option, the one I did). 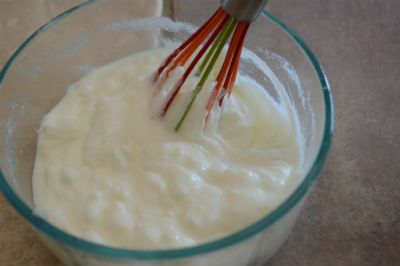 Mix the yogurt sauce ingredients well. 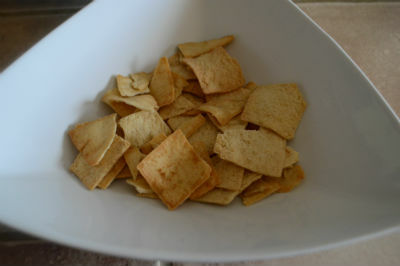 Assemble the dish by layering the pita chips on the bottom of your serving dish. 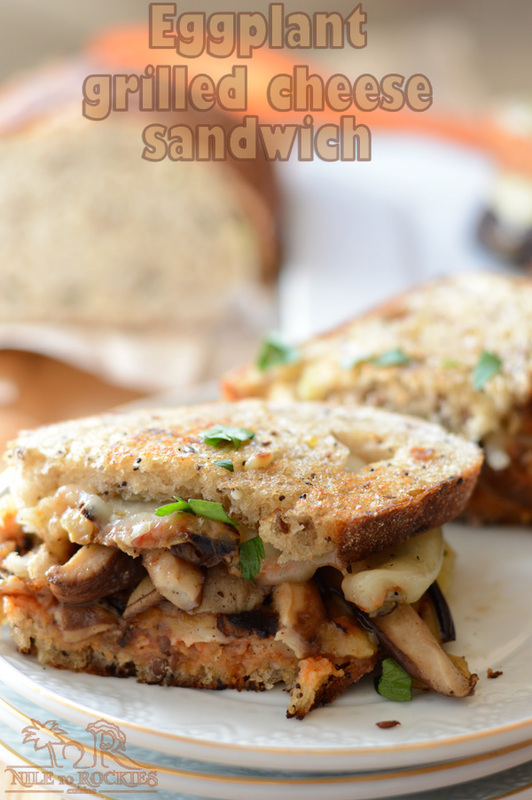 Top with a layer of roasted eggplants. Then a layer of the saucy meat. Then another layer of the eggplants, and so on until the eggplants are finished, make sure to end with an eggplant layer. 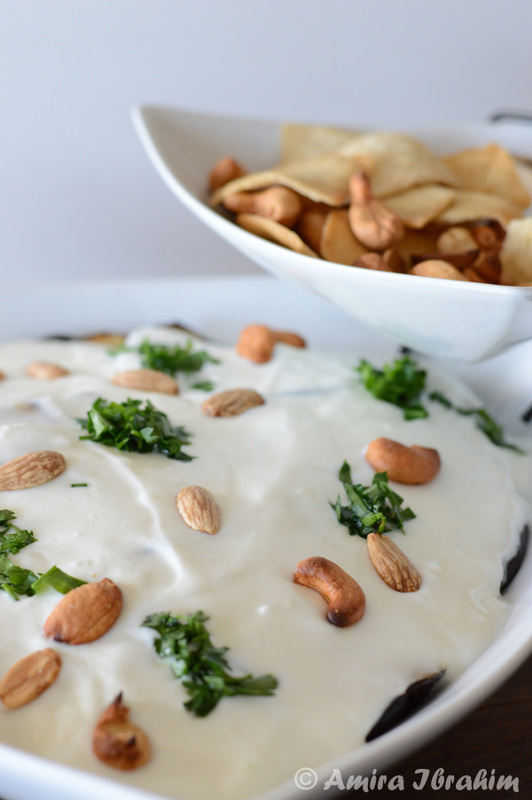 Top with the yogurt sauce and sprinkle some roasted nuts on top , preferably pinenuts. Need more eggplant recipes? 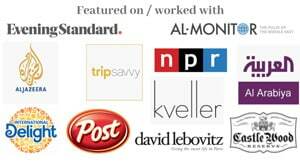 We have A LOT, check them out here. Meanwhile here are some of our favorites. Well I am a fan, looks really great 🙂 Reminds me a bit, juts a bit, of a Greek moussaka.